Christians Provide Free Labor On Jewish Settlements Many evangelical Christians believe it is their duty to help Jews expand the Jewish state. They have provided money to help the settlements grow, and now they are coming to labor in the vineyards, which they see as fulfilling biblical scripture. Evangelical Christians from the U.S. are living and working at Jewish settlements in the West Bank for weeks at a time. The Christians see Jewish expansion in the area as fulfilling biblical prophecy, though the settlements are a contentious issue between Israelis and Palestinians. Here volunteers harvest grapes. It's wet and windy day in Shilo, a Jewish settlement in the central part of the West Bank that has about 10,000 residents. In addition to the settlers, there are a few extra people staying in Shilo on this day. They are Christian volunteers from the U.S. who have spent the morning pruning the grape vines. Now, with a winter storm beating down on the hills, the volunteers are stomping with their mud-splattered boots and North Face rain gear. "We don't bring people here that are expecting mud baths and skin treatments and things like that," says Tommy Waller, a large 50-year-old man with a big smile and a prophet's long beard, who hails from Franklin, Tenn.
"We're kind of rough guys, nice guys, a lot of us are rednecks from the South," he says, "wanting to do a good thing and to help people." Waller founded HaYovel, a nonprofit group that brings Christians to what his website calls "the mountains of Israel where prophesy meets reality." The problem is that the world doesn't recognize this West Bank settlement or any other as part of Israel. The Palestinians and most of the international community view the Jewish settlements in the West Bank as illegal. The Christian volunteers pay for their tickets and cover their own expenses to come. 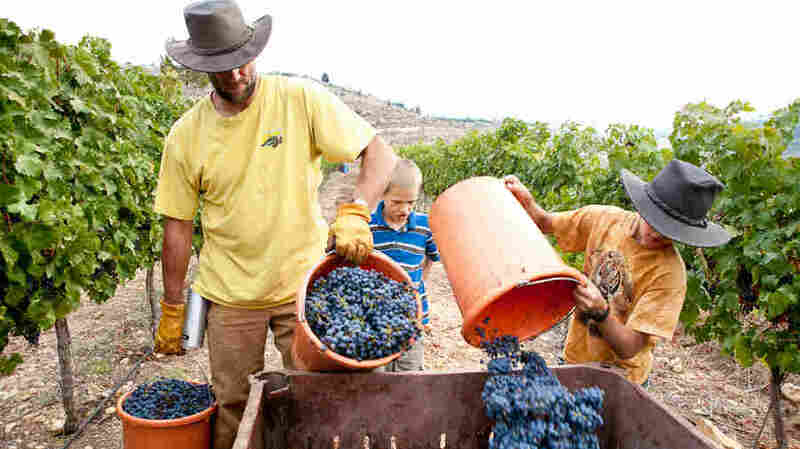 They work for about six weeks at a time, mostly in the wineries. Hundreds take part every year. It's a kind of a work-stay program with a spiritual purpose. We take the Bible and we look at those things and we see that one of the exciting things for us is that prophecy of scripture is being fulfilled. "We take the Bible and we look at those things and we see that one of the exciting things for us is that prophecy of scripture is being fulfilled," Waller says. Many evangelical Christians believe that the end of days and the coming of the Messiah will center around Israel. And they interpret the foundation of the Jewish state as biblical prophecy becoming reality. It's a hugely emotional issue for the Christians who come. They believe it is their duty to help Jews expand their control over Judea and Samaria — the biblical names for what is now the Israeli-occupied West Bank. For the settlers, the presence of the Christian workers has more practical applications. "Today we have more than 200 acres. It's a lot of agriculture and it takes a lot of work," says Veret Ben Sadon, who helps run the Tura Winery. "We saw that we cannot work alone. I can say for sure that without this help, we cannot do what we are doing today." Essentially she gets free labor for the heavy seasonal work that needs to be done. She says there is a labor shortage in the area and the Christians fill the gap. When asked why she doesn't hire Palestinians, who account for the vast majority of those living in the West Bank, she says: "We believe that a lot of them are our enemies and we don't want to give them work. We prefer to give work to our friends and our neighbors and that's what we are doing." The Palestinian Authority discourages Palestinians from working in the Jewish settlements. But jobs in the Palestinian areas are scarce, and Palestinians do work in construction, farming and other manual labor jobs. Building Support In The U.S.
Christian volunteers also give the settlers a boost when it comes to building support in the United States. Back in the meeting hall, Yisrael Medad, a spokesman for the Shilo settlement, jokes and sings "Onward Christian Soldiers." He has an unambiguous message for the volunteers. "I would hope that each one of you would write a personal letter to any or all of your elected officials," he says. Over the years, that call to activism has paid off, with many Christian groups in the U.S. providing political and financial support for the settlements in the West Bank. When members of the HaYovel group aren't here, they are on the road in the U.S., speaking at churches and community centers. Medad says that support is vital. "America is a democracy and a congressman or a senator has to listen to the people who vote for him," he says. "If you can bring pressure, fair pressure, that's the way you go."